Squared pencil drawing by Thomas and William Daniell of a distant view of the Black Town, an elephant and palanquin in foreground, dated November 1792. 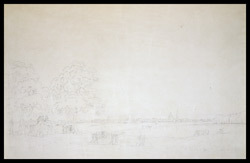 Originally inscribed on mount in ink and pencil: 'Part of the Black Town, Madras.' This is the original drawing for 'Oriental Scenery,' part 2, plate 8. After the establishment of the Company's factory at Madras in 1639, weavers and merchants were attracted from many other south Indian centres, and settled along the coast north of Fort St George, in what became known as 'Black Town,' as opposed to the 'White Town' in the fort. Black Town was also included within the foritifcations of Madras. The area was renamed Georgetown after the visit of King George V. The large domed building is the Armenian Church of 1772, and to its left the minarets of a mosque built by Muhammad Ali, the Nawab of the Carnatic.